Mac users who’ve demanded the ability to have different people working on the same QuickBooks files at once will soon get their wish fulfilled when the next version of QuickBooks arrives for the Mac. Software maker Intuit says that the 2011 version of the accounting and small business management application will add multi-user functionality. Intuit will announce QuickBooks 2011 for Mac on Tuesday. The finance application will be available for download or for phone and Web orders on September 27, with copies arriving in retail outlets by October. Up to five users will be able to simultaneously view and edit data files in QuickBooks 2011. When QuickBook 2011 does arrive, it will bring with it the ability to let up to five employees simultaneously view and edit QuickBook data files. The feature had been a much-requested one among Mac users of Intuit’s accounting program. “It’s been a long time coming,” William Lynes, QuickBooks product manager, told Macworld. In addition to multi-user functionality, QuickBooks 2011 users will also have the ability to set permissions in up to eight activity areas, spelling out what users do and don’t have access to. Everything from invoices to customer information gets updated dynamically, so that users can see records as they’re being created and updated. Multi-user functionality and the ability to set permissions for those users make up just one part of Intuit’s three-pronged effort to update the Mac edition of QuickBooks. The multi-user features fall under Intuit’s goal of allowing the application to grow as the needs of a user’s business evolved. But Intuit also focused on making everyday tasks easier and improving QuickBooks’ customizability with this update. The new version of QuickBooks includes the ability to track mileage and add it to invoices. In QuickBooks 2011 for the Mac, it’s easier to enter that data into the application. The new version also gives users the ability to add mileage data to invoices if that’s something a user includes for billing. “It’s the same workflow for expensing other things, including time,” Lynes said. 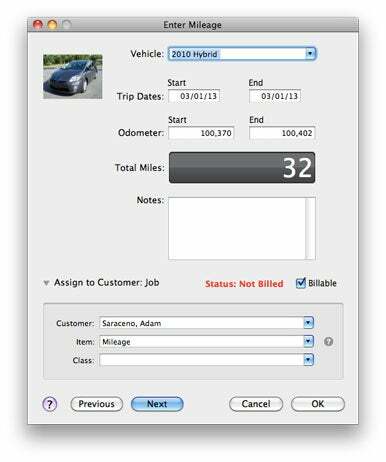 As part of the mileage tracking features, QuickBooks adds four new reports: mileage by vehicle summary, mileage by vehicle detail, mileage by job summary, and mileage by job detail. QuickBooks 2011 adds new register sorting capabilities. Users can now sort account registers by date, type, number, and amount, in addition to other fields. The update also adds the ability to export reports to Apple’s Numbers spreadsheet application. Previously, QuickBooks users who wanted to get their data into Numbers had to export the file as a CSV; however, they lost formatting and formulas in the process. Improved Numbers exporting is ideal for users who want to consolidate info from multiple franchises or keep a historical record of their business in a second application, Lynes said. “It’s a big time-saver for users of QuickBooks and Numbers,” he added. In addition, QuickBooks 2011 gives Mac users access to Little Square, a free, online magazine with information geared toward QuickBooks for Mac customers. That info includes videos, articles, and other resources. 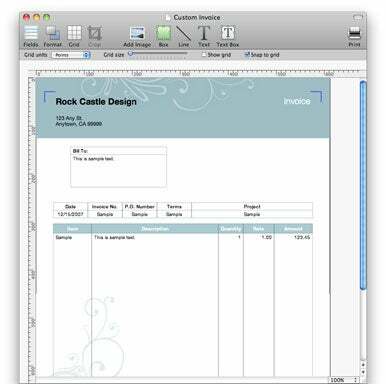 Intuit improved the layout designer in QuickBooks 2011, adding more tools for creating customized forms. As for customization, QuickBooks 2011 features improvements to the layout designer that give users more tools for creating customized forms for estimates and invoices. The new tools includes ones that simplify image cropping and field alignment to give invoices a professional look. Reports are also easier to customize in QuickBooks 2011, according to Intuit. Lynes says that feature has been rebuilt with “a more modern Mac-like interface” that allows users to change the formatting and appearance of reports. Mac users have long complained that their version of QuickBooks lacks feature parity with the Windows offering, and Lynes concedes that this version is still not the same application that QuickBooks users on Windows experience. “But we’re doing the best we can to make the best product for our users,” he added. 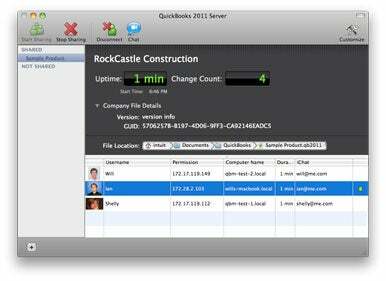 QuickBooks 2011 for Mac costs $230 for a single-user version. Two-user and Three-user versions of the application cost $440 and $600, respectively, with additional seats available for $210. The application runs on Mac OS X 10.6 and requires 1GB of RAM and 120MB of hard disk space. You’ll need a Mac with an Intel Core 2 Duo to run the server for multi-user functionality. The ability to export report data requires Numbers ’09 or Microsoft Excel 2004 or 2008. Intuit says it’s participating in the Office 2011 for Mac beta program and hope to support the new version of Microsoft’s office productivity suite, which is set to ship in October, but that it’s not officially supporting the upcoming version of Office at this time.